2019 has arrived and there is never a dull moment on the Internet. With people coming up with all sorts of trends and challenges, it makes our lives a little bit more “woke”. The latest trend taking over the Internet lies beneath the beauty community called the #BratzChallenge. Yes, we actually meant the iconic almond-shaped eyes adorned with eyeshadow, and lush, glossy lips, Bratz Dolls. Now you may be wondering, how is the beauty community involved with the Bratz Dolls? Well, beauty gurus have been recreating some unforgettable Bratz beauty lewks and they’re absolutely stunning! The Bratz Dolls were the “IT” thing back in the early 2000’s and every cool kid had one. All we wanted was to dress up and look like the dolls, and now the beauty community is making it a dream come true for us all with their own tutorials! If you think this is just another trend that come and go in seconds, well you’re so wrong honey! Because it’s so big that even Sister James Charles had to do his own Bratz Doll transformation! People often call out Kylie Jenner for being a real life Bratz Doll because she owns everything a Bratz has to offer – lips, body and outfits. She’s basically living her life in the fab lane, sweethearts. 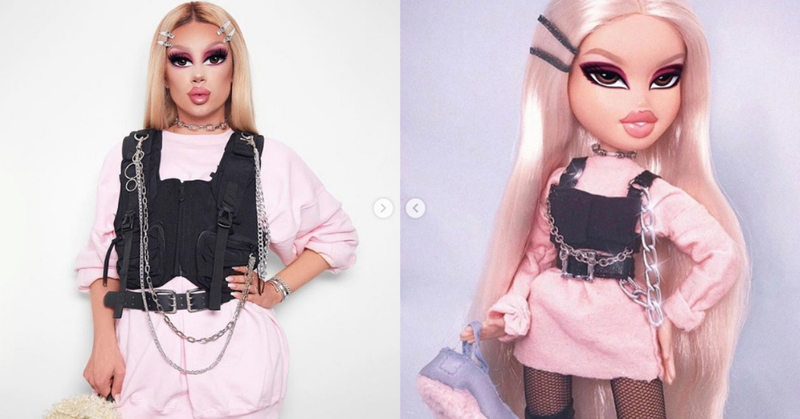 Well, now that it’s a trendy challenge, maybe you can recreate your favorite look from one of the dolls too! What do you think about the #Bratzchallenge? Do you think Sevenpie should do a rundown on the best top #Bratzchallenge?